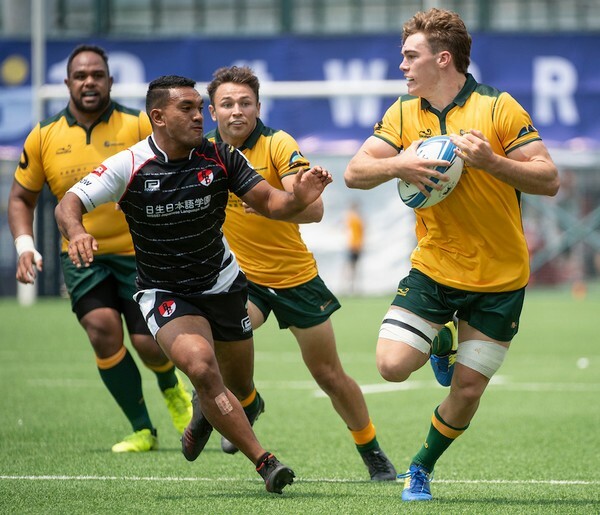 Stephen Larkham's Classic Wallabies upset the seedings by reaching the Cup quarter-finals at the GFI HKFC 10s for the first time, while ninth seeds Projecx Waterboys of Scotland stunned defending champions Biarritz Gavekal on their way to topping Pool A with three wins. Wendell Sailor, Stephen Hoiles and Patrick Phibbs are representing the Classics for the third year in a row, but the presence of five Australia Sevens players helped the 11th seeds defeat Asia Pacific Dragons 19-5 and edge two-time champions Grove Penguins 14-12. Larkham's men lost 15-12 to hosts Natixis HKFC in their last Pool C game and lost several players to injuries after a gruelling day for many teams, but still made it through to the top eight. "I'm really proud of the effort by the guys," ," said Larkham, the legendary former fly-half who helped Australia win the 1999 Rugby World Cup. "It has been a really tough day. It was the pool of death and you can see that. "Everyone's sore and they've bashed themselves." Waterboys beat eighth seeds Kir Club Pyrenees 17-5 and then provided the shock of the day with a 14-12 win over Biarritz Gavekal. Second seeds Tradition YCAC topped Pool B ahead of A-Trade Overseas Old Boys, while three-time finalists Samurai International beat Mourant Fiji Army 29-5 to rack up their third straight win as both teams progressed to the Cup competition from Pool D.